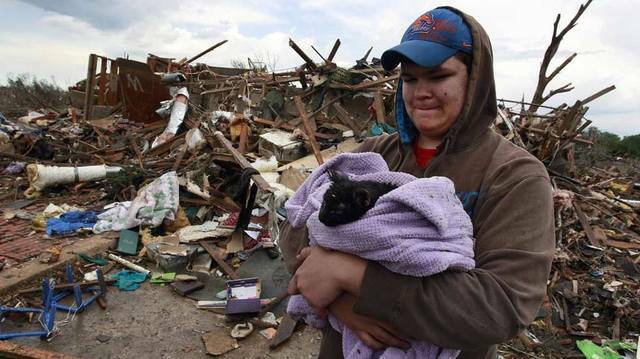 The effects of the recent tornadoes in Oklahoma have not only affected families, but also animals who have lost their homes and been separated from their owners. Local animal shelters are trying to save these lost animals and help them find their families. There are hundreds of animals that have been sheltered since the tornado incident, and these centers are putting forth a great effort to try to reconnect them to their families. Local police and residents are continually looking for dispatched animals and placing them under the care of these shelters to help their families find them. Local shelters such as the Animal Resource Center and the Oklahoma Humane Society are posting pictures of lost animals online in hopes that their loved ones will recognize them. The Oklahoma Humane Society had reconnected 58 animals out of the 120 that is has received. Other shelters have about 300 animals left. Other agencies are also helping the shelters through funding and volunteers. Pets placed under the care of the shelters are being given veterinary care before they are reconnected to their families.